Preheat the oven to 180°C (350°F). Cut the pumpkin into chunks. Place in a baking tray, season with salt and drizzle with olive oil. Cover with aluminium foil and roast for 30–35 minutes, until tender. Remove from the oven and set aside until barely cool enough to handle. Remove the skins and place the pumpkin flesh into a large mixing bowl. Add 350g (2 cups) of the dry burghul to the cooked warm pumpkin. Knead the pumpkin and burghul together, as this will soften and soak the burghul. Add 1 teaspoon each of the cumin and baharat and more burghul if needed if the mixture is still too wet. Add the grated onion, herbs, a pinch of the chilli powder, if using, and the citrus zest and knead all the ingredients together by hand, gradually adding the flour, using just enough to reach a firm dough consistency. Cover and refrigerate for 30 minutes, as this will allow the mixture to further absorb the fluid and make it easier to mould. Now for the filling, heat the 2 tablespoons of olive oil in a large frying pan and sauté the finely diced onion until it is translucent. Add the remaining 1 teaspoon each of baharat and cumin and the chickpeas and stir through. Add the mixed greens and continue turning and folding until the greens have wilted. Add the sumac. Lower the heat and season with salt, pepper and chilli powder, if using. Remove from the heat and set aside to cool. If you are planning to add the feta or haloumi, add it after the mixture has cooled slightly. To make the stuffed kibbeh torpedoes, it will help to have a small bowl of water handy, as you will need to dip your fingers in water from time to time. Take a small amount of the kibbeh mixture and roll it into a small ball, about the size of a ping pong ball. While holding the ball in the palm of your left hand, wet the tip of your right index finger and place an indent in the ball. Gently create an egg-shaped cavity by rotating the ball while at the same time pressing into the mixture and shaping it into a hollow shell. Fill the cavity with the filling mixture and then close the opening by forming a peak then form the egg or ‘torpedo’ shape in the palm of your hand. Place on a lined tray and chill for at least half an hour before frying. Heat the vegetable oil in a deep-fryer or deep saucepan. Fry the kibbeh a few at a time, being careful not to overcrowd the pan, until they are a light golden brown. Drain on paper towel and serve warm or hot. I love to have plain unsweetened yoghurt or labne drizzled with olive oil as the accompaniment to this dish. 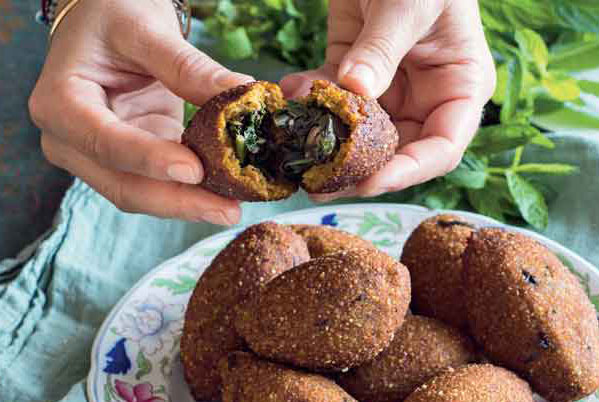 This recipe from Lebanese home cook Judy Saba is one of the many delicious dishes from Maeve O’Meara’s cookbook Food Safari: Earth Fire Water, available in stores nationally.